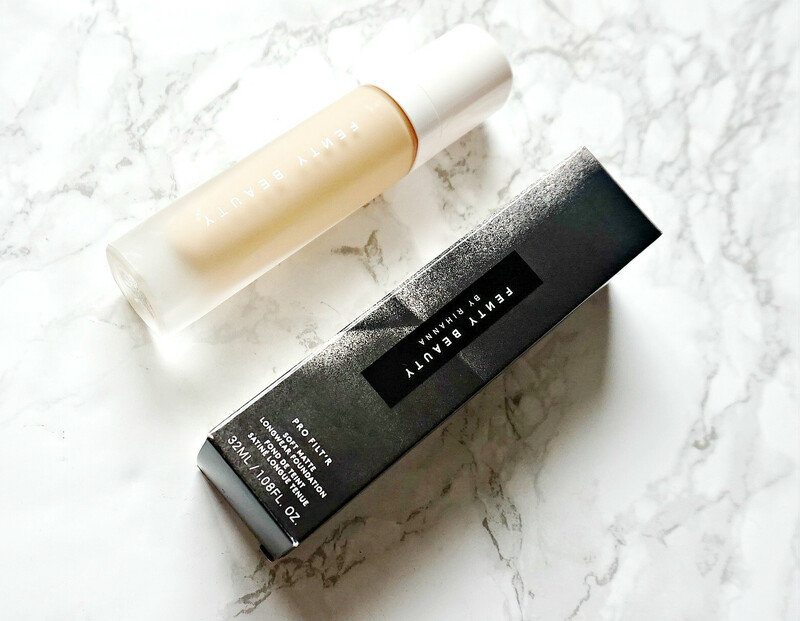 Last month, Fenty Beauty launched with a bang and whilst some of the products didn't particularly interest me, I decided that if I was only going to try one product from the range it had to be the Pro Filt'r Soft Matte foundation. Although I generally prefer glowy base products, I thought that a soft matte might work for me, even if I had to add an Illuminating Face Mist to add some luminosity. I have seen lots of positive reviews of this foundation but today I wanted to tell you how it performed on my dry skin. First up is the packaging - the glass bottle is heavy and feels expensive and I'm glad that it comes with a pump - it's a pet peeve of mine when foundations don't have pumps. There are 40 shades available, which is brilliant and many claimed that it was the first brand to release so many shades but Make Up For Ever already offer a huge number of shades for all skin tones. I ordered online and chose a shade that is a little too light for my skin but I'm still tanned from my holiday at the moment so I have been mixing it with Chanel Soleil Tan De Chanel to make it work. That being said, it does oxidise a bit when it sets so I would really recommend that, where possible, you go to a counter with a little pot and ask for a sample. The formula is a light liquid - not overly runny but not too creamy. You need to work fast buffing this into the skin as it sets quickly. The coverage is pretty full and it has a demi-matte finish. The first time I used it, I hated it - it accentuated any dry patches of skin and really gathered around my nose. I just couldn't wait to get it off my face. Since then, I have tried it with around 5 different primers before settling on one that makes it look good on my skin, which is the Hourglass No28 Primer Serum. This is an intensely moisturising primer and the foundation literally glides on over it and doesn't cling or gather in any dry patches. It glides over my pores, without highlighting them and doesn't accentuate any fine lines. In terms of longevity, it's one of the best foundations I have used - it doesn't budge and it feels comfortable on the skin, surprisingly lightweight given how full coverage it is. From hating this foundation, I have grown to really like it but my skin has to be well prepped and I have to use that particular primer, which isn't cheap. I think that in general it would suit oily or combination skin best but if you have dry skin, like I do then be prepared to keep on top of your skincare routine to make sure your skin is in good condition and you're going to need a very moisturising primer. It is worth the effort though, particularly if you have an event to go to where you want your makeup to last all day without any touch ups. Have you tried this foundation or anything else from the Fenty Beauty range? I'd love to hear your thoughts!